Street lighting accounts on average for 40% of a City’s electricity bill: not surprisingly, it is one of the first services City managers focus on when challenged with budget constraints or green targets. Lots of communities are implementing Smart Lighting programs, which typically mean switching to LED luminaires to increase cost efficiency and sustainability performance. But is this enough? Turning street lights to energy-efficient LED lamps can save up to 70% in power consumption, GHG emissions and related costs. Additional results can be achieved when transforming the lighting infrastructure into a sentient network, leveraging platforms such as PE Smart Urban Network to enable full remote management and control of single or grouped luminaires. City managers can quickly and easily connect street lamps to a wireless IoT network, with the opportunity to turn them on/off from a central web-based console, and adjust brightness to balance quality of service and resource consumption. Moreover, by interfacing street lights with motion sensors or vehicle detection systems, dynamic sensor-based lighting can be triggered, further reducing consumed power up to 30%. Adaptive lighting patters can be defined, ie. turning lamps on in real time upon vehicle or pedestrian transit, reducing brightness in low-traffic areas or empty roads, etc. 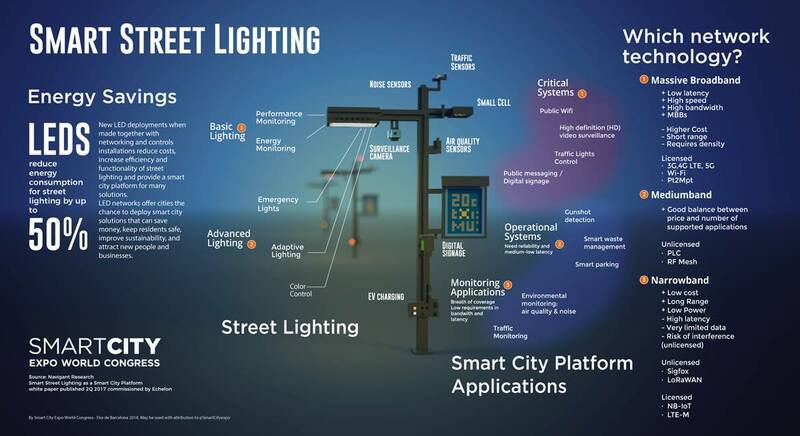 Ever thought street lighting might become the backbone of your smart, connected City? PE Smart Urban Network provides a truly multi-application technology to monitor and control a number of devices through the same software and hardware infrastructure. From video surveillance cameras to air quality sensors, from digital signage to EV charging systems, City managers can finally move away from multiple, non-integrated networks managing services one by one. If you want to discover more, join us at Smart City Expo World Congress, taking place in Barcelona (Spain) on November 13-15, 2018 – more to come in the next few weeks.